Panorama WMMG-7-27 Mimo antenna. True Mimo two cable setup. Antenna comes complete with two 16' Cables terminated in SMA Male. The WMMG antenna from wpsantennas.com provides an innovative and future proof solution for 2G / 3G and 4G networks. Incorporating two separately fed ultra wideband elements in a single housing the WMMG is equipped to provide client side MiMo and diversity support for the networks of today and tomorrow. With 2dBi gain at 698-960MHz, 5dBi gain at 1710-2170MHz and 4dBi gain at 2.2-2.7GHz the WMMG provides extra gain performance where it is needed most. 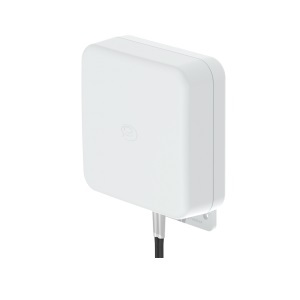 The rugged, weatherproof housing is designed for wall mounting. Wall and mast mount brackets are provided. 16 Feet of fitted low loss double shielded twin cable minimizes exposed connector joints and simplifies cable management for easy installation. The WMMG is an cost effective value added product for network operators and service providers ensuring a stable link with improved data rates for subscribers thereby improving satisfaction and retention.